ARTiVIS is an exploratory research project that proposes to investigate innovative concepts and design methods regarding the use of real-time video as raw material for artistic exploration on environmental causes. In this practice-based research, we can also play a role as promoters of change in people’s behavior regarding forest protection. 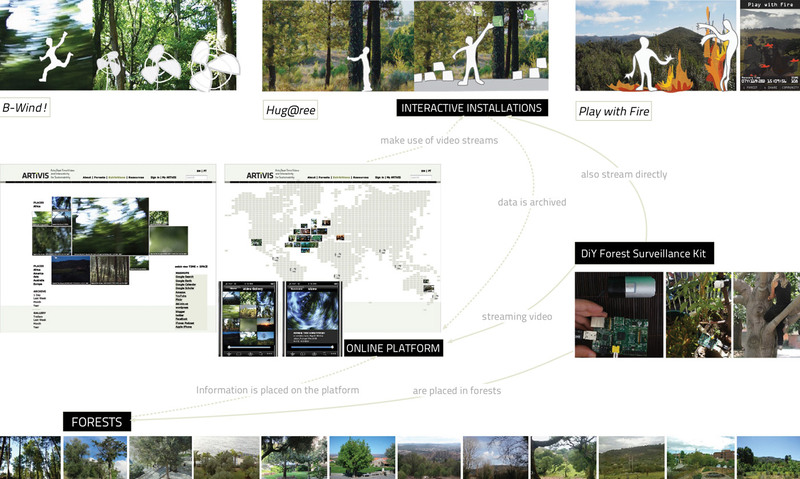 Can Digital Arts foster awareness and respect for nature? As a step in answering this question, we seek to contribute with a constructive approach to the destructive dynamics of fire that aggravate climate change, by addressing artistic, scientific and technological dimensions of the challenging issues explored in this research. The outcomes of ARTiVIS include an online platform, interactive installations and the design of a surveillance kit prototype. From the process developed so far, we infer that these experiences contribute to a feeling of belonging, providing contact with nature and leading to social change through awareness on environmental issues – ultimately, for the design of a more sustainable environment. The ARTiVIS project started in the scope of the PhD research in Digital Media by Mónica Mendes, with Nuno Correia and Sílvia Chicó as thesis advisors. The research was done under a fellowship by FCT (Portuguese Foundation for Science and Technology) in the framework of the UT Austin-Portugal Program.